Welcome to day 3 of the blog hop! There is a lot going on in this post! Cutter blade as it spins. So when Pat asked me to test out the rulers I was very excited! Regular readers of my blog know that I'm a bit of a notion junkie. • Full see-through NON SKID frosting keeps the ruler from sliding and makes it light enough to see your fabric through it. • Unique red grid system to highlight the ½” marking, using both lines to square up blocks or to cut squares effortlessly. • Diagonal with dots large enough to see for fabric positioning. • Large numbers for easy visibility that never blend into the fabric. • Very light ⅛” markings do not distract when using the most common ¼” markings. The fantastic Monica aka Happy Zombie designed this great graphic for the hop! The rulers are available in 10 sizes. I decided to test out the 4.5” x 37” and the 16.5” x 16.5” square. As Kelly wrote on Monday you will hear a sound you are not used to when first using these rulers. The sound comes from the metal of the blade going along the metal of the ruler during the sharpening process. I like these rulers. They take a bit of time to get used to, but the sharpening part does work. I tested it out with a sharp blade and a dull blade to see for myself. I did have a video tutorial planned for you but life has prevented me from finishing it in time. Hopefully I'll have the video done for you soon. The 4.5” x 37” is now the longest ruler I own. It is very handy to have a long ruler for trimming the sides of my quilts once they are quilted. Also since it is about a yard it helps in measuring out fabric. The 16.5” x 16.5” is now my largest square ruler. I love using square rulers to trim blocks. Summer of 2006 came and along with it our Bi-Annual Sorority Convention. A Notice went out about collecting items for the silent auction. Even though I loved my quilt I decided to donate it to help raise money. Many people began to bid on the quilt, but quickly a bidding war started between Kristin and Bobbi. Bobbi won. Before I knew it summer of 2008 had arrived. I was on the Convention team and at the last minute decided to make the quilt again so that Kristin could have one. I started it on 7/3 and finished it on 7/5. She was completely shocked and loved it. While all the letters are different fabrics I actually had enough of the border, sashing and backing fabrics to make them the same. A lesson I didn't learn until this year. Earlier this year I attended an event with Bobbi. She mentioned how she uses the mistake in my quilt to help teach the Greek alphabet. I said.. "mistake"?? Apparently despite my planning and taking progress pics along the way... I reversed the Tau & Upsilon. I'd like to think that I only didn't notice because they are similar in shape. At least I got the second one right! As a part of this blog hop Pat asked each of us to post a recipe. Those who know me, know that I can't cook. Lucky for me she said we could as for help! Mix your graham cracker crumbs, your sugar, your melted butter, and cinnamon until well blended. Press the mixture into the bottom of a 9 x 13 pan. Put it in the refrigerator for at least an hour before serving. Keep it chilled when not being served. I did post two recipes before. Apple Pie and Chocolate Covered Pretzles. 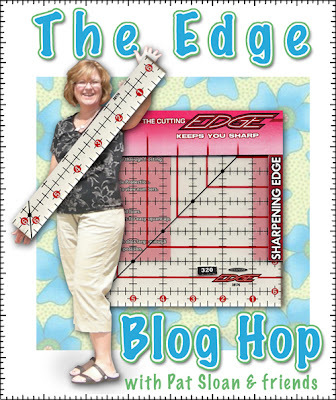 To be entered to win a set of rulers you must comment on each of the posts participating in the blog hop! Comments are now closed. The winner will be announced soon on Pat's Blog! Great recipe and looks easy enough to make. I am keen on the rulers as keeping the rotary cutter sharp as it cuts is a good idea. Thanks for the giveaway. Great review! I had never heard of these rulers before this. Fun post Julie. I'm definitely interested in trying out these rulers. I love it that they sharpen the blade and are non-skid. Even better to know that you recommend them. I can't wait to try the new rulers!! Great job on a first quilt! Isn't there a story about how native americans always have a mistake in their work? Cheesecake sounds like my kind of easy desert!! I absolutely love these rulers. I am a huge fan of quilting notions and tools and these look great. Fingers crossed! Cute idea of a Greek alpha quilt. I absolutely love cheesecake. Oh that cheesecake sounds like one I make, I am not allowed to visit anyone without one during the Christmas party season. Love cheesecake!!! can not wait to get one of the new rulers. Can't go wrong with cheesecake! Love the rulers. Thanks. I would love to have that 4.5 x 37ruler and it sharpens the blade too, wow! Love your first quilts and was amazed at how fast you assembled them. Cool quilt, thanks for sharing it with us! The more I read about those rullers the more I want to have one of them. Great giveaway! These rulers look very interesting, I am always up for something new to make my life easier, thanks! Your recipe sounds very yummy! I think I´ll try it some day. Would LOVE to win the rulers! Until now I don´t have a lot of rulers. I love how different everyon's first quilt stories are! Also I love how funny they are! Wow these rulers are a really neat idea. I hope that I have the luck to win some. thanks for giving us the chance. Both of your Greek letter quilts are beautiful. Mistake or not, they both look great. 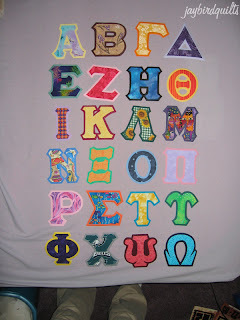 I started with Greek alphabet appliqued sweatshirts in college too! They were expensive in the bookstore, and fun with fabrics you picked to match your sisters. I always enjoy your reviews, Julie. Thanks for participating in the hop! Love chocolate covered pretzels!! I want the rulers. 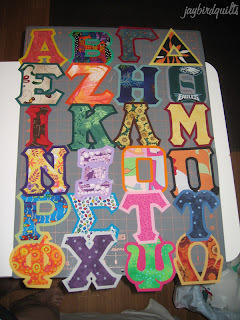 Cute story about the Greek alphabet quilt. These sound cool. Neat that someone is making improvements on stuff you don't even think about. Your letters- ugh! Sometimes you just dont see these things! Ack. Loved that story, and how generous to make a second quilt for your friend!! I'm new to your blog, and enjoyed it very much reading thru previous postings. Thanks, bunches! My dh loves cheesecake, and I like baking, especially when I don't have to turn on the oven! I have a 37" ruler already, but one that is 4" wide would be more useful. Thanks for testing the Sullivan rulers! Loved your story about the Greek alphabet quilts! Quilt looks great. I didn't notice the mistake. I sent a link to your blog to my daughter who is big on her sorority. I think she will love that quilt. Thanks for sharing. I would never still be quilting if I had to do it all with templates. And rulers that sharpen at the same time? Genius! Thanks for the giveaway! Thank you for giving us a chance to win the rulers. I need! new rulers.! Thank you for participating in this fun blog hop and thank you for sharing your experience with me...I have made several of those 'mistakes' too. One could argue whether they are mistakes or just making sure people are paying attention. Thanks for the recipe and the great advice when using letters. I just was stamping a piece and I now have a backwards capital D. I am going to chalk it up to the charm of the piece! Thanks for participating in the giveaway! I would have goofed on the alphabet. Love cheesecake and your work is great. Too funny on your quilt. How awesome that there was a bidding war. I would love to win the rulers. LOVE all the quilts I've checked out on your blog. Thanks for taking part in the ruler give-away. They look amazing, and I'd love to win! Google is messing with me, and not letting me sign in, so my email is wvoaks @ comcast.net. I enjoyed the story of your innocent mistake on the quilts! You are a very fast quilter, too! I'd love to be entered for the rulers. Your friend must have been delighted! What a great thing to do. I was curious to see if the rulers would actually sharpen a dull blade...it'll be so nice to get a longer life on those expensive blades! My first thought for such a long ruler is why? but you gave a good way to use it truing up the quilt sides before quilting....hmm that would be handy. Love those recipes. Thanks for sharing. Love your blog. Must come back later to read more. Love the rulers also. Please enter me. I am going to get one of these rulers to try. Nothing like sharpening your ruler as you cut. I love this idea for posting first quilts. It's great to see how everyone has come along. Thank you for the yummy cheesecake recipe. Please enter my name in the giveaway. Great review! Cute quilt! I didn't notice the letter mix-up until you pointed it out. Thanks for sharing the cheesecake recipe! Yum. Boy, these rulers would save on blades! Ohhh-that cheesecake recipe sounds great. I like to make 2 quilts at the same time too, but I am more selfish and keep one for myself. These rulers are a brilliant idea! Sign me up! I'm more excited about this than even FABRIC! Love the rulers! I am so excited to have a chance at winning! Thanks for the yummy cheesecake recipe! Thank you for the review. Once you get used to what you are using its hard to change over...they sound great though. These rulers sure look interesting..I have a bunch of dull blades..I'll have to go and get one to try out! Thanks for the review. These rulers sound so awesome! Thanks for the review. Wonderful new rulers and the recipe for cheesecake is what I need for a quilt retreat. Oh my, how nice it would be to have the long ruler. Its annoying trying to trim and square up the quilt using even a 24in one so a 37 would be great! We have a family full of Greeks and none are the same, with a quilt like yours they could play greek bingo! I feel as I'm a winner already....all the recipes sound delicious. I love cheese cake......I'm going to save this one and try it when my weight loss challenge is over.....mid Nov. I'll treat myself after my last weight in. I really really really would love to win the ruler set. Thank you to you bloggers testing and writing about them. This is a great blog hop. Thanks bunches. Cute quilt. Thanks for a chance to own what sounds like a terrific ruler. Easy recipe-love those! And it sounds so easy. I love your first quilt story-it's nice to know that other people make mistakes too. The rulers sounds interesting. I know I would love that very long one. I have done many projects that I had wished someone had made one. i am loving the recipes and shared quilt stories that come with this hop. thanks for sharing. that pie sounds amazing. these rulers are just too cool....how clever to sharpen as you go. I do not have a rotary cutter and still cut with a template and scissors! Would love to win. The other blog for the 29th has still not put up the post!! I am worried!!! Funny story about your mistake in the alphabet! The more I hear about these rulers the more I want them! The recipe sounds delicious! CAn't wait to try the rulers. Really? I can't use low-fat cream cheese? Well, I guess if you insist. The rulers look cool, too - I like that they have less markings. that cheesecake looks simple to make. Thanks! Coming over to you with lots of love from IHAN! Terrific stories, quilts, gadgets & recipes - AND giveaways! - who wouldn't love it! Please tell me I've won those rulers at kcallander989[at]gmail.com. THANKS! What a great idea for these rulers. I'd love to own them and try those out. The blades for our rotary cutters aren't cheap and if these work as well as you are saying, they will help to save money. Thank you too for the cheesecake recipe. I LOVE cheesecake but not the New York style and your recipe looks wonderful. Your quilt story was great and the cheesecake recipe sounds good. Thanks for being part of the giveaway. Good review of the rulers. I love your quilt story. Lots of interesting stuff on your blog. my current rulers have seen better days as they've been used so much that the markings are worn off, and lets not even bring up the 6x24 ruler that was snapped in half while inside my suitcase . 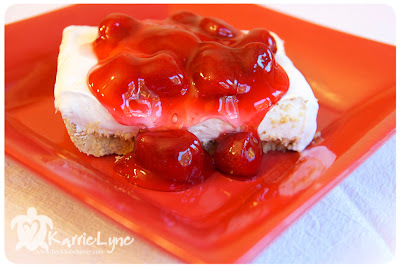 . .
Will definitely be trying your no bake cheese cake recipe as we live in FL. The rulers do sound wonderful, especially the self sharpening and a great variety of sizes. Thank you for the informative review and a chance to win. Those are pretty impressive quilts for your first tries. You go getter you!! Both the cheesecake and the rulers look great! Thanks for the chance to win. 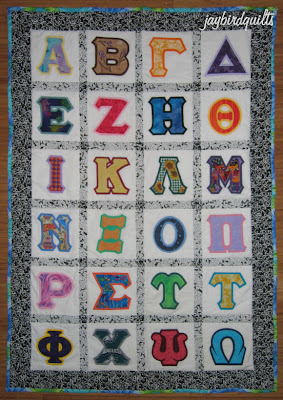 I've made alphabet baby quilts before, but love the Greek alphabet idea for a college student! ooh, love cheesecake.. will have to try this recipe... I saw the rulers earlier this week but didn't know about the sharpeners. Thanks for pointing that out. I have some blades I was about to toss, but I'll keep them now. Took me a minute to find your mistake but I finally did after comparing the pictures over and over again. Thanks for the recipe too! I like the whole concept of these rulers. Makes good sense if they allow you to get more life out a rotary blade, because they are expensive replace. This recipes sounds pretty good too. Thanks for sharing. Great recipe! I love your tutorials. With each new comment about the rulers I am eager to give them a try. I look forward to reading more on your blog. Those rulers look so cool! I've been eyeing that 16.5" square! Now I really have to go and buy some cream cheese! Thanks for the recipe and the review. Glad you tried sharpening a blade. I think these rulers are a great idea. Thanks for joining Pat on the hop. 37" long !?!?! that would be the longest for me too if I won. And yummy, cheesecake, I love cheesecake. Your cheesecake recipe sounds wonderful. I'll give it a try. Thanks for the chance at the giveaway! Thankyou for such a great review of the rulers, they sound fabulous. I'd love to win one. All these delicious recipes, we'll all need a month of exercising to work them all off! I love your Greek alphabet quilts. And the cheesecake sounds yummy. Thanks for participating in this giveaway. Loved the story/recipe looks great. The rulers sound wonderful! Those recipes look deadly! I LOVE cheesecake AND chocolate covered pretzels...there goes the diet...again! Thanks for the review, the recipe, and the chance to win those rulers! Thanks for the receipe and the ruler review - can't wait to try both! That's pretty funny about your "mistake" quilt. I hope it was funny for you-I'd have probably been mortified! Love the chance to win the rulers! Great recipe. Thank you. I hope I win. Great review of the rulers and I can't wait to make the cheesecake for Thanksgiving. Thanks for giving me such a easy idea of my pass along dessert. golly I have never heard of a 37" ruler...my longest one is 24"!! this is a fun blog hop!! Cool quilts... Thank you too for the ruler review and the opportunity to win a set! Thanks for the recipe and the giveaway. These rulers look great. Thanks for the honest review, Julie. This blog hop is fun...keeping me "in the loop" for a few days at least. Best, always. I made a lot of t-shirt quilts in college for my friends. It was a great money maker for me and I enjoyed designing them. Great review of the rulers!Love the concept of a non slip ruler with the bonus of a rotary cutter sharpener. Oh and the Cheese cake sounds devine! Thank you for hosting in the give away, Sharonj. Love the cheesecake recipe, but will have to pass on it for now! I am so ignoring the cheesecake recipe... I love cheesecake...I do not NEED cheesecake... I am a cheesecake junkie. Great post today! Thanks for the review and the recipe and for a peek at your two Greek quilts ... very cool! I totally love your disclosure LOL And a ruler 37" long....oh a treasure to have for sure! Great recipe too! These rulers look brilliant, as does your cheesecake recipe. such great rulers. thanks for a great review. i am excited to try for myself. Thanks for the review. I am new to quilting and have made several purchase choices based on your reviews over the past. I value your comments. Thanks for the giveaway. Happy blog hopping. I would love to win those rulers! Please count me in the giveaway! I love cheesecake and love new recipes to try. I'm loving the bloghop and getting to see all these new blogs (to me) can't wait to look through all your tutorials! Your cheesecake recipe sounds wonderful and I can't wait to try it. I really want to win a set of these rulers. Seems as though cheesecake is popular and I agree! Those rulers are a "must have" and I sure hope to win...if not, I'll just console myself with that yummy cheesecake! Thanks! Fun quilt story! I've noticed mistakes in my quilts after they've hung on my wall for years, so I can relate! A 37" ruler would be great for cutting borders, and big chunks. A sharp blade would be nice too! Now I love cheesecake, so thanks for the recipe - and thanks for the giveaway also! Oh Boy New Rulers! I'm always up for new gadgets. The rulers would be great!!!! Thanks for the chance to win! Thanks for the great ruler review. I know now that I need them. And I am going to gain 10 lbs. just reading the recipes. The cheescake looks yummy and simple. I love that there is a 37" ruler. Can't wait to try them out so I hope I win! Your recipe looks great I will try it. Thanks for being a part of this hop. Would I love to win the rulers! Can't wait to try one of those rulers. I need a new long one. Great cheesecake recipe. I really enjoyed the story of your twin quilts. I have a friend that would enjoy it, too, so will send her the link. Thanks for sharing! I am anxious to see Pat's rulers and hope to find them at a nearby quilt shop really soon! What a great receipe, cheese cake is my favorite. I love the sound of those new rulers and the chance to win a set. Thanks for all you do. Your quilt story is very charming, and the recipe sounds great, and very easy. Thanks. I ADORE cheesecake and will have to give this one a try! The rulers look amazing. A genius idea. I love your quilt stories! How wonderful to make so many people happy. And I love you moto-if only fabric could cure all the worlds ails! Thank you for sharing you insight on these new rulers. And for the receipe! Happy blogging! I really need these rulers! All these reviews are making me want them! I was content with my little bitty ruler until I heard how great these are! These rulers are fantastic. My are old and tired. Nothing goes together better than quilting and food. I'd love to try these rulers! Love following the blog hop...hope to be a winner. The rulers sound awesome - I could really use one long enough to trim quilt sides. 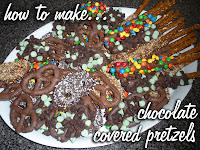 Also made note of your recipe for chocolate covered pretzels - these sound delicious! I love cheesecake and will give this one a try. Your quilts are lovely. I had to look close to find the mistake. It was sweet of you to make the second quilt for your friend who lost out on the first! Your first quilt is a whole lot cuter than mine. Thanks for sharing! I am very impressed by your story of how you made the quilt in one day. WOW!! the cheesecake recipe sounds great too!! I would love a chance at winning the rulers. Thx for the chance to win. Thanks for the review of the rulers! 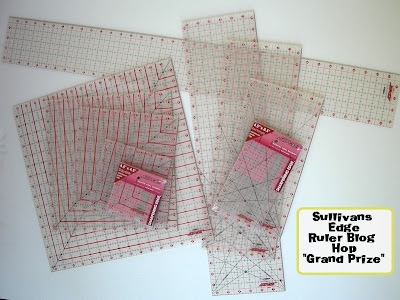 I would love to win a set of the rulers -- cutting is my least favorite part of quilting, but if you cut right everything seems to fit together perfectly. Also want to try your cheesecake recipe - it sounds delightful! Will have to try these rulers! Finally a long 37" ruler..I must have that one! I sure do love a good cheesecake so will have to try this out! Thank Kerry Lynn for us!! The rulers look amazing and I can't wait to try them out! I thought your greek alphabet quilt was beautiful and no one I know would have caught the difference! Cinnamon in my Cheesecake crust, YUM! Might have to try that recipe. I really wnat to try out these rulers!!! Hope I win! What a fun giveaway! Thanks I'm on day 3!! I can't wait to try that cheesecake recipe! It sounds really yummy. Would love to win a set of those rulers. They sound like just what I need! What a great design for those rulers. Would love to try it in person. That recipe sounds divine! thanks! I like your quilt. The rulers must be very good. I will try your receipe. I love your quilts-mistake or not. Thanks for the thorough review of the rulers! The more I read about these rulers, the more I wish I had some. Thanks for the chance to enter the giveaway. Your cheesecake recipe sounds great! Oh, cheesecake made easy, I may make that for my birthday on Friday! The rulers look wonderful and to sharpen your blade at the same time you cut is just to good to be true! Your recipe sound yummy! Wow I love cheesecake...my favourite dessert! Bet this one will be fantastic. Your first quilt is great and only someone who knows the Greek alphabet will notice the error...LOL and that's not me! Oh I love you Greek quilt. I giggled about the reversal of the letters though. I would not have known the difference but my hubby and his whole side of the family are Greek and I would have never heard the end of it if I would have done that. I'm really loving all the reviews of the rulers - they sound like a great set. And I love your quilt! Thanks for sharing. I think the rulers sound spectacular. So I would love to win! Cheese cake... #1 dessert in my book! I don't have a recipe like it so will definately be trying it out. All my recipes are baked. Have a fantastic fall day! I love first quilts. They are never what they seem yet still it sparks something inside all of us: the love of quilting! I can't wait to try out these rulers. There's nothing I hate more than a dull rotary blade. Thanks for the reminder to recheck before sewing. I had extra blocks cut, but ot sewn, for a friendship style quilt, and zipped them together one day. I put them on my design wall, and walked past them for over a month, before I noticed there were mistakes in 2 of them. Glaring large misplacements of triangles!! lol. Can't wait to try this recipe! I am sooo wanting some of these rulers. Cannot wait to find them in the LQS. Cheesecake is also my favorite. Thanks for the recipes. These rulers look wonderful to use and I can't wait to try one. I've been following your blog for awhile but have not found a place to comment till now...so just know I'm enjoying your posts and pics. Thanks for the review. I would love to have these rulers. The recipe sounds great. I work hard on all this stuff.